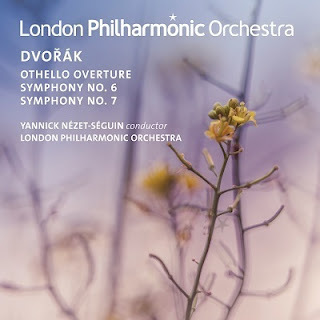 Some very attractive performances here, of Dvořák symphonies from the London Philharmonic and their dynamic principal guest conductor, Yannick Nézet-Séguin. The blurb tells us Nézet-Séguin secured that position with an earlier performance of the Sixth, in 2007 when he must have been impossibly young, so there was some logic in his returning to the score and for the LPO Live label to take it down. Nézet-Séguin, while a specialist in the late Romantics, usually tends towards heavier fare—Mahler, Bruckner, Shostakovich. That tendency is apparent here in his emphatically symphonic approach to the two symphonies. Everything is done on a grand scale, with broad, flowing phrases. Tempos are often on the steady side, but nothing sags, thanks to the solid string tone and definite accents. A strong agogic sense maintains the connection with the Bohemian folk sources; just listen to the way that Nézet-Séguin leans into the downbeats of the Sixth Symphony’s adagio—it’s slow and broad, but it’s never static. Orchestral playing throughout these performances is excellent, the string sound and the lower brass always solid, and the woodwind soloists suitably characterful and energetic. The only lapse is in the strings in the Sixth Symphony scherzo. Nézet-Séguin may be pushing them too hard here, as the violins sound scratchy in the top register, keeping up with the conductor’s fast pace, and often at top volume too. The Seventh is a better fit for Nézet-Séguin’s emphatically symphonic approach. Where others keep the tempo of the first movement exposition steady, to give a cyclical quality to the many returns of the opening theme, Nézet-Séguin is more dynamic, gradually building into the main argument. He loses some momentum in the development but returns to form with the return of the main theme. That is a recurring impression in these recordings, of the conductor giving weightier interpretations than the music can sustain. Yet there is a consistency here that makes every interpretive decision seem logical. And even if Nézet-Séguin sometimes tends towards the overly dramatic, he can never be accused of affectation. Just listen to the inner movements of the Seventh. The Poco adagio is a case study in lyrical simplicity, with the conductor simply relying on the elegance of the woodwind solos to carry the melodies. The scherzo third is marked Vivace, but, unlike in the Sixth Symphony scherzo, Nézet-Séguin here errs on the side of caution, taking a moderate tempo but shaping the music effectively simply through emphasizing the swells at the start of each phrase. Distinctive readings then, probably most attractive to those who like their Dvořák properly symphonic. The first disc opens with a filler, the Otello Overture, curious programming, as the work is surely better served when presented with the other two overtures of the set (which would have fitted, although concert programming naturally dictates the choices here). On the other hand, Otello is the least performed and least loved of the three, so is most deserving of a solo outing. And Nézet-Séguin’s approach here is ideal, again highly dramatic and cleanly articulated, with an ideal storytelling quality expressed though the varied tempos and strongly delineated structural sections. It seems unlikely that a full symphony cycle is on the cards, but more exposure to Nézet-Séguin’s Dvořák would be welcome, the earlier symphonies could benefit from his broad, dramatic approach, as could some of the more obscure tone poems.